I think you can click the picture to embiggen if you'd like. I love this piece and it was accompanied by not one, but two, online classes from Craftsy, both of which will help me to learn to create my own fabric pictures. Woo hoo!!! One of the other special gifts I received was a beautiful antique gold necklace, gifted to me by our daughter-in-love. The necklace belonged originally to her paternal great grandmother and is a family heirloom for sure. It made me cry that she would want to give me such a precious piece of her family history. Once I have it cleaned I will share a picture so you can see how wonderful it is. request for votes for my adorable grandson! - If you have a little girl to create for, how about checking out the links HERE? If you scroll down there are also links to some cute Barbie and American Girl doll patterns. - If you would like to see what's happening with the 'Never Ending Sampler' online freebie class that Pam Kellogg is doing, have a look HERE. I'm a bit late joining the party, but have decided that I'm going to play along. Of course I HAVE to be a non-conformist and I'm using waste canvas for mine so you'll have to wait a bit to see what I'm doing. I will share though - once the canvas is removed. - There's a great article HERE regarding the proper fillings to use when making your own pincushions. - I'm sure none of you have a sewing space that's in need of cleaning and organization, particularly after the Christmas creative rush...but....if you do, there are some good tips HERE. Not that there would be any need of these hints in MY life!!! ahem. - Further on the cleaning thought - I'm sure many of us have lots of UFO's lurking about, and so perhaps THIS year-long fun challenge might be just what you need! (Thanks Renee for the head's up on this one). 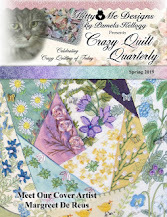 - Kathy Shaw has announced her schedule for her free online crazy quilt (and a little bit of sane quilting too!) classes for 2017. Have a look at that HERE. - For you sane quilters out there, you need to check THIS year-long project out! Best thing is that it's free AND a great stash-buster if you so choose!! - If there's a baby due to make an arrival in your life, perhaps you might like to check out the adorable bootee patterns through THIS link. There are five pages of really amazing ones to see! Your quote today is from Arnold Bennett...."The chief beauty about time is that you cannot waste it in advance. The next year, the next day, the next hour are lying ready for you, as perfect, as unspoiled, as if you had never wasted or misapplied a single moment in all your life. You can turn over a new leaf every hour if you choose"
Finally, I want to extend my very best wishes to you and yours for the very best that the new year can hold. May it be filled with joy, laughter, love and many hours filled with new leaves. The hectic part of the season is over and now it's time for the cocooning to begin (at least here at Chez Magpie). After Christmas for me has always been a time to sit down and delve into as many books as I can manage to read until the urge passes. The projects for Christmas giving are done and nothing new is clamoring to be created (not to say that the to-do list isn't trying to attract attention!). My studio is as tidy as it ever gets and I hate the thought of messing it up, at least for a few days. I think this was one of the best Christmases I've ever had. I actually got a few things that are for creating with - something I am always happy to get and rarely do. I was even given a couple of online classes through Craftsy - both of them about creating pictorial quilts which is something I have wanted to try out for some time. I have a glimmer in my brain that I would like to attempt to re-create old decrepit barns in fabric. So many of them are falling down in total disrepair and nobody seems to care. Perhaps trying to recreate them in fabric might be a good thing. On the other hand, the technique is so far removed from my normal range of ability and I'm quite truthfully terrified to even try it. Maybe now I've put my dream into print and shared it with you I will be honour bound to at least give it a try! Alas there are no pictures of my creations to share with you today, so how about I show you one of Jack's creations instead? We spent Christmas with our #1 son, daughter-in-love and grandson and their dinner theme was 'southwestern'. Pecan pie is, of course, part of that. Jack is well known for his amazing butter tarts, so it wasn't much of a stretch to create a pecan pie. - There's a great tutorial HERE for dying buttons. - I'm sure most of you have a 2017 calendar already, but THIS freebie one is absolutely beautiful and you might like to download it. You might just want to use the images themselves in your projects! - If someone in your house got Lego for Christmas, perhaps THESE fun ideas might be just the thing you need to keep them occupied over the rest of the holidays. Scrolling down to the bottom will yield another link to yet more ideas. Your quote for today is another one from an anonymous source... "Life is too short to wake up in the morning with regrets. So, love the people who treat you right and forget about the ones who don't. And believe that everything happens for a reason....if you get a chance, take it; if it changes your life, let it. Nobody said that it would be easy. They just promised it would be worth it"
There ends my shameless pleading for votes and now back to the regularly scheduled mumblings! First of all, I want to share one of the pieces of music that I find the most meaningful this time of year. It's not an old carol and I don't think it's one that you will likely hear too much on the radio. However, it reflects the true meaning of the season and has the additional side effect of making my cry every single time I hear it (and no, it isn't sad....just beautiful). Please go HERE for my Christmas gift to all of you. - Patterns for mug cozies abound but THIS one is perhaps the nicest I've seen. - THIS is a cute little fabric basket tutorial - perfect if you might have a quilting friend you'd like to give some fat quarters to. - HERE is a sweet little Christmas mouse pattern. Or how about THIS adorable little owl? Or maybe THIS monkey ornament? - If you're planning to gift a bottle of wine this Christmas and don't want to use the boring paper gift bags made for the purpose, how about whipping up THIS? Today your quote is one I know I share every year, primarily because I am obviously still a kid at heart and never grew out of my love for Dr. Seuss and The Grinch... "And the Grinch, with his Grinch-feet ice cold in the snow, stood puzzling and puzzling, how could it be so? It came without ribbons. It came without tags. It came without packages, boxes or bags. And he puzzled and puzzled 'till his puzzler was sore. Then the Grinch thought of something he hadn't before. "What if Christmas", he thought, "doesn't come from a store. What if Christmas, perhaps, means a little bit more?" Another search for something to show you today yielded this...not very exciting perhaps and not a great picture, but desperation is as desperation does!! beads on one of the ornaments is crooked. oops! Every year I create a series of ornaments for gifting; some are gifts in and of themselves, and others are used as 'bows' on other gifts. These are two of the ones I made this year...no two were the same (as is the case of real snowflakes!). Even better was that all the raw materials came from my stash so they cost me nothing (shhh, don't tell!!). Tutorial for these can be found HERE. These were really easy to make and a couple of evenings in front of the tv created all 20 ornaments that I needed. - I think THESE look so pretty! Both lit and unlit. - THIS made me smile and I think you will too. - No pattern for THIS, but it's just so darned cute that I had to share! And don't you know at least one person that would laugh at one of THESE? (be sure to scroll down). For the cat lovers, go HERE. - I came across THIS idea and had a 'why didn't I think of that' moment....and, even better, it's a great stash buster! Today your quote comes from an anonymous source (but thought to be from the heart of a 7 year old)...."Love is what's in the room with you at Christmas if you stop opening presents and listen"
I can't show you any more than that, but suffice to say it's definitely something that's outside my comfort zone! - I thought THESE were intriguing....perfect for those that get cold feet in the house in the winter time. - Another thing that falls under the awwwwww category HERE. - And if you want to see some amazing quilts, have a look HERE. - If you have a sewer on your gift list, perhaps one of THESE would be the perfect thing? And this is something that appeared in one of my groups this morning and I thought it was something that should be shared as much as possible. Beware of a piece of paper on the back window of your vehicle - it's a new way do a carjacking. You often don't see it until you get in the car and shift into reverse to back out of your spot. You notice the piece of paper and stop and get out to remove it, leaving your car running AND your purse on the front seat. Just enough time for a carjacker to leap in and take off with your car AND your personal information, including your house and car keys. Police recommend that if you see such a paper, drive away. Do NOT stop and remove it until you get home!! Please consider sharing that information! Today your quote is from Calvin Coolidge... "Christmas is not a time nor a season, but a state of mind. To cherish peace and goodwill, to be plenteous in mercy, is to have the real spirit of Christmas"
First of all, I want to thank all of you that voted for my adorable grandson in the baby contest. Please keep voting if you'd care to (scroll down to my previous post for further info). In my search to find something (anything!) that might be post-worthy today, I suddenly remembered that I don't think I shared this particular piece with you. This is a family tree picture that I created for the 'Crazy Quilt Gatherings' Autumn 2016 issue and was conceived during one of Kathy Shaw's online crazy quilt classes. I don't normally work from a pattern per se, but tend to just wing it (which can get me into some 'interesting' situations). Anyway, the class module required that I design a block, including all the stitches I planned to do. The design languished in my files until Pam Kellogg issued a challenge to come up with something genealogy-related for the magazine. This is what I created. my husband and sons on the top. If you're interested in learning more about this piece, you can purchase a copy of the magazine HERE. - There's a sweet cross stitched cardinal pattern HERE and a wonderful Christmas reindeer pattern HERE. - If you crochet and would like to whip up a quick gift, how about a set of THESE? And if you would like to add an angel (or several) to your tree, THIS pattern is really cute. 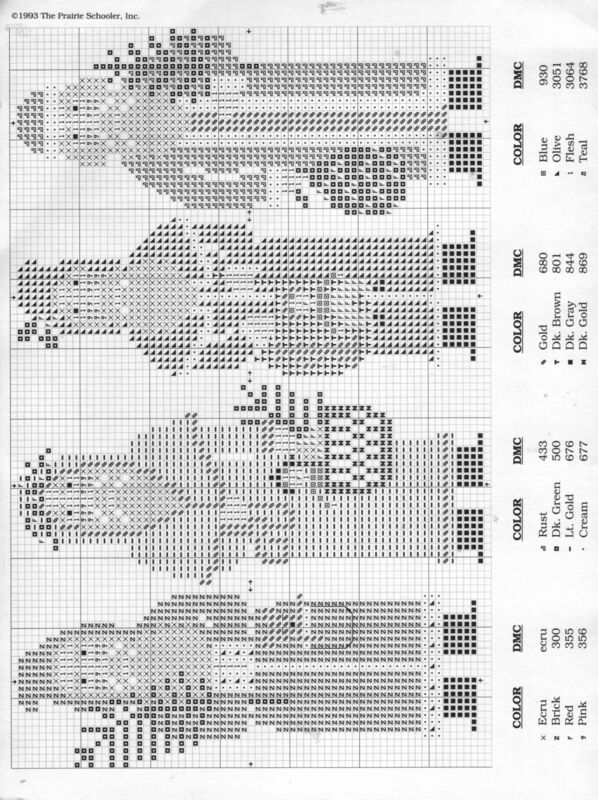 Or maybe you would prefer a beaded angel using THIS pattern? - Knitters might really like THIS Christmas tree. - There's a handy printable HERE that gives you knitting and crocheting abbreviations and HERE is one that unravels the mysteries of all those different numbers you find on the ball band labels of yarn. - If you want to calculate the amount of yarn you need for a crocheting project go HERE for a handy chart. - Mary Ann gave me the head's up about a 'One Year of Stitches' challenge that's happening HERE. I rather like this one - it's easily portable and not hugely time-consuming. - Crocheters might find THIS little fellow something they might want to make. Or maybe one of THESE? It might be a little late to make one of THESE for this Christmas but fun to think about for next year! And for all around cuteness have a peek at THIS. - I found THIS to be quite intriguing. If you have a collection of small doilies you don't know what to do with, perhaps you might like to attempt making something similar. - HERE's another little something that falls under the awwwww category (if you want the pattern, don't be put off by the screen that pops up asking for registration, just wait a second or two and it will come up). Today your quote is from Harlan Miller....."Probably the reason we all go so haywire at Christmas time with the endless unrestrained and often silly buying of gifts is that we don't quite know how to put our love into words"
Yes, I DO have something!!!! Anyone who knows me knows that I'm a proud grandma....and.....my little grandson is in an online baby photo contest!!! I am not above pulling out all the stops and unashamedly begging for votes. So....have a look here and please vote for Theo (oh, and you can place a vote every six hours....ahem). ....is yet more mumblings! I'm working on something, but I can't show it - yet. So, here's another installment of mumblings - please feel free to talk amongst yourselves. - There's an adorable pattern HERE for some snowmen - perfect for package toppers and Christmas trees (oh, and a little stash busting perhaps!). - HERE you can find a basic pattern for a hot water bottle cover - another good stash buster - and something that you can change up to suit. - If you're a quilter and happen to like houses, there's a nice free block of the week pattern HERE. Limited time to get it though. - There's a beautiful shawl pattern HERE. - THIS falls under the awww category for cuteness. - These are so cute - and would look good on a Christmas tree too (particularly if they had a pretty ribbon around their neck). And HERE's another cute wee mouse mitten pattern. Or how about THESE cute little fellows? Or maybe THIS one? - There's an absolutely adorable knitted polar bear pattern HERE (and while you're there, have a look around the rest of the site - there are tons of free knitting and crochet patterns!). - maybe you like goats? Or sheep HERE , HERE, HERE, and HERE. Today, fittingly, your quote is about boredom (because I'm sure you are thinking that about some of my posts! )...and comes from Nicholas Hoult...."Long-term boredom can't lead to anything good"
Fill it up, Santa, please! Our newest grandson HAS to have a Christmas stocking for Santa to fill, don't you think? is already tucked in the toe! There is no pattern per se for this one - It pretty much came out of my head, although I did find the reindeer on the internet. - There are a couple of interesting online classes open for registrations at the moment. Karen Ruane is offering her newest class HERE (scroll down to find out more) and Suzy Quaife is offering a 50% discount on her 'Peaceful & Pondering' lace journal book class HERE. - There's a really cute pattern HERE for a little teddy bear. - How about a wonderful little Christmas tree pattern from HERE? 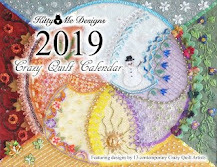 - Pam Kellogg has now released all 12 of her 'Cats & Quilts' cross stitch patterns and they are available HERE and HERE. She has also released a wonderful series of booklets about 'Colour & Composition" which can be found at the same links. As many of you know, Pam's husband has been diagnosed with cancer and she is trying to help pay the medical bills by any means possible. Purchasing her publications is one way you can help out. - For those of you who live in cold climates, perhaps you might like to make some of THESE mittens. Today your quote is from 'Maxine'...."Christmas is just plain weird. What other time of year do you sit in front of a dead tree in the living room and eat candy out of your socks"
Two little monkey finger puppets all ready for two little grandsons. Pattern is 'Sock Monkey Finger Puppet' from HERE. - There are some cute Christmas coaster patterns HERE. - HERE you can find a great tutorial for making quick pillowcases (great idea for gifts, particularly for children & teens). 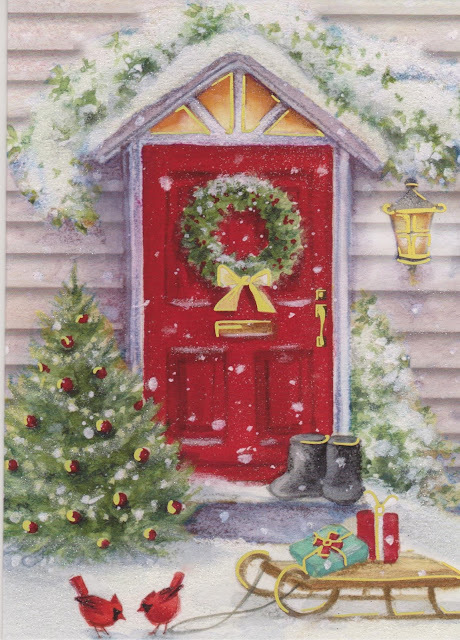 - There's a ton of free cross stitch Christmas patterns HERE. The site isn't in English but for these you won't need to worry. Be sure to scroll down! - If you like cats, you will love THESE cute ones! Free pattern to make your own. - If you don't have much space to put up your large ironing board, perhaps you'd like to make one of THESE for use with your smaller projects. Today your quote is from Suze Orman...."No woman can control her destiny if she doesn't give TO herself as much as she gives OF herself"
Some knitting - who knew? Our oldest grandson is currently in like with "dine-O-soars" (his word) so what could a doting grandma do but make him his very own DineOSoar sweater for Christmas? The pattern is from a Beehive booklet called "Knit Menagerie" and was made using Paton's Canadiana yarn. As a little side note, Logan's Uncle Shawn had the very same sweater when he was little, but his was red and was made by one of my friends. Wonder where it ever went. - There's a really pretty pillow tutorial HERE. - Kreinik (who makes the wonderful threads) is running a 25 Days of Christmas project and will be publishing a daily free project. You can find info about that HERE. There is also a ton of free projects from them available HERE. - You can go HERE for part one of making one of the sweetest gingerbread houses you've ever seen - with a crochet hook! - How about a stash busting idea HERE to make one of the nicer mug cozies I've seen. - I really like this simple pattern for felted slippers! - I can see these made using twine (jute, perhaps?) - maybe even a set of three. - For the cuteness factor, how about THIS (the pattern isn't in English, but there's a translate button). And there's even more amazing cuteness HERE. Be sure you scroll down! And how about this sweet little guy? - I'd love to make one of THESE for our grandson! - AND - just for something that's great fun, have a look at this video!! Today your quote is from an anonymous source...."The greatest gifts are not wrapped in paper but in love"
Today I don't have a picture of anything I've done to share with you, but I would like to tell you about a fun thing that's happening over on Pam Kellogg's blog. It's called a 'Never Ending Band Sampler Stitch-Along' and is absolutely perfect for anyone who likes to work with waste canvas or even weave fabric...crazy quilters and those who like cross stitched samplers will love this. Pam will be offering several free patterns each week for us to play with. This is going to be SO much fun!! And best of all - there's no pressure...no time frame....no expectation that you have to 'keep up'. (Have a look HERE to learn about it!). You can go HERE to see the first pattern she has for us. I'm joining in with plans to download the patterns and create a wonderful stitch diary for future reference. - THESE mittens would be such a cute gift for a youngster. And wouldn't THESE mittens be wonderful on a Christmas tree...or used as an advent calendar? - If there's someone in your life that might have cold feet, perhaps a pair of THESE might be welcome under the tree this year. - HERE's a great way to wind yarn into a center pull ball - without a ball winder. - THIS is an interesting way to use up your stash I think. - You could make THESE for many different uses - perhaps brooches; tree ornaments; or package toppers. - If you have an incomplete Scrabble set, perhaps you might consider making some ornaments similar to THESE. - Do you have some leftover mason jars taking up space in your cupboard? Maybe one of the many ideas HERE might be just the thing to make use of them! Be sure to scroll down to see all the ideas. - THIS is a really nice crocheted Christmas tree pattern! You could add beads to it for 'decorations'. Today your quote is from Andrew Weil....."The power to heal is in you, and nonetheless there is a tendency in our culture to project onto other people and to want them to heal us"
and now, for something other than quiet books! His beard and his hat were done with crazy quilting and the face was appliqued using an image I found online. Hopefully you can see more of the details in the closeup. I think you can likely click on the pictures to embiggen them more. The pattern and instructions are available in the Winter 2016 issue of the 'Crazy Quilt Quarterly' magazine which you can find HERE. - There are lots (and lots!) of small free cross stitch patterns HERE. Be sure to scroll down to the very bottom of the page where you'll find a list of what she has available. Better pour a cuppa before you go though! - If you're looking for an easy scarf pattern (and one that would work up fairly quickly) how about THIS? I love the thought of using some of the beautiful variegated yarns that are available now. - HERE's another cute stash-busting project that would be wonderful for teenagers or if you want something a little more classic how about THIS one? - if you happen to be gifting a bottle of any sort at Christmas, how about adding a cute little topper from the pattern found HERE? They'd also make cute tree ornaments! - This site isn't in English ( there's a translate feature) but truthfully you don't need it - the pictures are gorgeous and the step by step instructions are easy to follow. So if you'd like to learn about making silk ribbon flowers, have a look HERE. Today your quote is from Ediwn Osgood Grover...."Santa Claus is anyone who loves another and seeks to make them happy; who gives himself by thought or word or deed in every gift that he bestows; who shares his joys with those who are sad; whose hand is never closed against the needy; whose arm is ever outstretched to aid the weak; whose sympathy is quick and genuine in time of trouble; who recognizes a comrade and brother in every man he meets upon life's common road; who lives his life throughout the entire year in the Christmas spirit"
Would that we could all be like Santa Claus. The quiet book is finished! I really don't think it should be possible to have so much fun making something, but this project certainly fits into that category. I'm almost sorry that it's done! The cover (above) has pictures of our grandson, son, and daughter-in-love. The back cover (below) is a Mr. Potato Head, waving goodbye. The pattern for him came from HERE. The pages measure approximately 11" square which seems to be a good size overall. If you ever plan on making one of these books, I would recommend not trying to sew the spine with your sewing machine....not that I would know that the needle would snap and leave the sharp point lurking within the confines of the book...why, no, I wouldn't know that. I ended up hand stitching the spine using dental floss (and my handy dandy pair of pliers!). - There's a pretty crocheted snowflake pattern HERE. - Another really nice knitted hat pattern HERE and another one HERE that would be perfect for a teenager. And go HERE for some of the cutest kids hat patterns (most are free). - And a pretty (and easy!) scarf HERE. - For those of you that like simple classic clothing designs, how about this knitted sweater? - For the sheer cuteness factor, THESE are such fun! Perfect for stocking stuffers perhaps? - For those who don't knit or crochet (or want a little break to try something else) THESE would make fun Christmas gifts too. - There's a cute crocheted angel ornament pattern HERE. Those ought to keep you busy for a little while! Today your quote is from Paul Gauguin...."I shut my eyes in order to see"
These are the final two pages for inside the quiet book (tomorrow I'll show you the covers). I decided to add something to the inside of the flap that opens to show the inside of the house so I added the lunch plate...just so he would have something to see when he opens it. The truck below has a zipper across the top and inside are felt transportation pieces (boat, bus; truck, car, airplane, and train). This book has been so much fun to make and I know I could go on and make a lot more pages, but it would be totally unwieldy if I did! - There's a free set of cross-stitch old world Santas HERE. - HERE's some links to some pretty knitted hats....perfect for Christmas (or any time) presents. - There are links HERE for at least a hundred crocheted snowflakes. - If you happen to have a baby to knit for on your Christmas list, how about something from HERE? - How about a really pretty crocheted poinsettia? It's HERE. - THIS is a really nice knitted hat. Wish I had seen this pattern before I made the one for our #1 son! - The CQJP (Crazy Quilt Journal Project) for 2017 is open and taking registrations. You can find more information HERE. Please note that the registration and information areas are along the top of the site. - There's a really cute crocheted Christmas tree pattern HERE. Your quote for today is from Mother Teresa...."Kind words can be short and easy to speak but their echoes are truly endless"
Today's quote is from Barbara Bush...."To us, family means putting your arms around each other and being there"
The above page has textures that he can feel. and forth on a ribbon. - There are a bunch of links here for making flowers - depending on the colours you use perhaps they'd look great as ornaments, or as decorations on hats, etc. - There's a really cute knitted snowman pattern HERE. - How about an adorable tuffet pincushion? - THIS isn't a free pattern, but it's oh so adorable (and useful too!). And - I want to wish a very happy Thanksgiving to my friends in the United States! Today the quote is from Meister Eckhard...."If the only prayer you say in your whole life is "Thank you," that would suffice"
but there is lace in all the windows. - I found THIS fun idea for a possible gift for a teenager. Well, some adults would find it pretty fun too, come to think of it! - Do you have some old CD's that you don't know what to do with? How about making THESE angels? - Pam Kellogg is releasing her 'Cats & Quilts' cross stitch designs. Have a look HERE for January's and HERE for February's. There will be a design suitable for each month. - HERE's a really cute knitted Christmas ornament - a good stash buster AND a great gift for a knitter! And how about THIS one? Today your quote is from Watterson Lowe...."Nobody grows old by merely living a number of years. People grow old by deserting their ideals. Years wrinkle the face, but to give up enthusiasm wrinkles the soul"
This one is a simple colour-match page done in the shape of a ball. I don't know if it shows up in the photo very well, but I embroidered the colour names on the underneath ball so he can not only match colours, but also match shapes and learn the words at the same time. It's pretty basic, but it's a good learning tool I think. - There's a cute free pattern HERE for some puppet mittens for little ones. - HERE you can find a nice tutorial for a makeup bag (or it could quite nicely hold sewing supplies too!). Great for stashbusting, and for Christmas giving! - There's a cute little knitted elf pattern HERE. Looks like there are links available there for a lot more too. 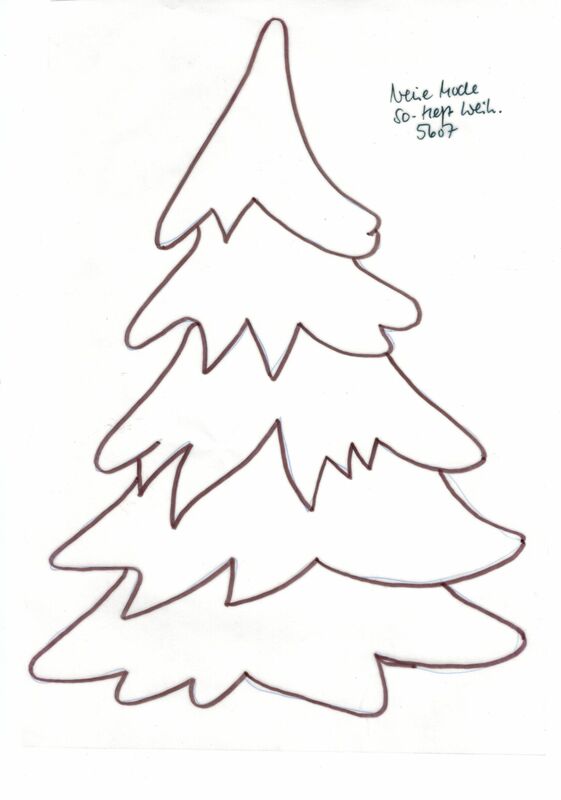 - I think THIS free Christmas tree pattern would serve a multitude of uses. I really like the design - perhaps for Christmas postcards? Or embroidered on a larger piece - or smaller on a crazy quilt. Lots of possibilities! Today your quote is from John F. Kennedy...."Peace is a daily, a weekly, a monthly process, gradually changing opinions, slowly eroding old barriers, quietly building new structures. And however undramatic the pursuit of peace, the pursuit must go on"